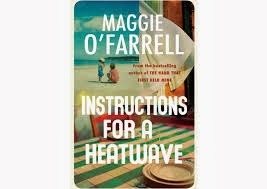 A review on Booking Mama alerted me to this new novel by Maggie O'Farrell, her sixth. I've read a couple of her books before - see my review of one here - and loved them, so I quickly checked the online catalog to see if the library had a copy in English. Score! The book is set in the summer of 1976 in London, which is straining under a fierce heatwave. Gretta Riordan's husband, Robert, leaves the house for his daily walk to pick up the newspaper, and does not return. The rest of the novel details how Gretta and her three adult children deal with and ultimately solve Robert's mysterious disappearance, all the while struggling with their own relationship issues. Michael, the brother, is trying desperately to save his marriage, while the two sisters, Monica and Aoife, not only are estranged from each other, but are dealing with problems in their personal lives as well. And all three of them have to figure out how best to manage their mother and the secrets she is unwilling to reveal. I loved this book. It sounds like quite a lot of heavy, somber material, but somehow O'Farrell manages to imbue the story with a sense of buoyancy. Hearing the dialogue with an Irish accent in mind, and imagining the characters with a (stereo)typically Irish no-nonsense, practical approach to the most difficult of situations (for example, the scene where the extended family comes by with sandwiches to commiserate with Gretta), gave the book a jaunty, almost comic feel. And yet at the same time, the author still tackles the difficult issues, revealing in small measures why Michael is having such a difficult relationship with his wife, why Monica and Aoife aren't speaking to one another, and finally why Robert disappeared. Adultery, abortion, illiteracy, sibling rivalry, deception - all these issues come to the fore in this family. Ultimately, however, what makes this book such a joy to read, is not all the misery, but in the way the family deals with it, forgives one another for their weaknesses and injuries, and moves forward. Imperfect as they are, they still love each other. This sounds like a book I might like. Yes, Andrea, you would! Her other books are great too, if you can get ahold of them. I love your review. You captured my feelings exactly! I am so glad you picked up this one!